It’s five weeks until Christmas (I know it’s hard to believe) and I’m sure we’re all counting down the days. But today is Stir Up Sunday which is the last Sunday before Advent and this day is simply designed to be a communal affair where all the family and even friends get involved in making a pudding. Below we have a recipe from Martha Collison, who was on this year’s The Great British Bake Off. 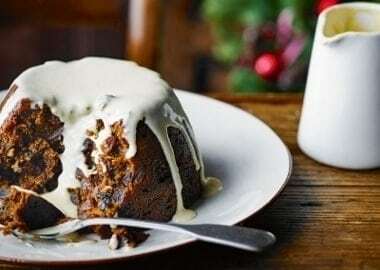 So let’s get stirring and make your very own Christmas pudding. Enjoy! 1. Grease a 1.5-litre pudding basin well with butter. Then place a disc of baking parchment in the bottom. Lay a sheet of tin foil just bigger than the basin on a work surface, then lay a sheet of baking parchment the same size over the top. Grease the paper and fold a pleat into the centre to allow the pudding room to expand. 2. Place the dried fruits, prunes and dates into a microwaveable bowl and pour over the brandy. Microwave for 4 minutes, stirring halfway through. You could soak the fruit overnight instead, but microwaving helps speed up the process. The fruit should be plump and have absorbed most of the liquid. 3. Use an electric whisk to beat the butter and sugar together in a large mixing bowl. Beat for around 3 minutes, or until light and fluffy. Add the treacle and mixed spice, then beat in the eggs one at a time. 4. Add the brandy-soaked fruit to the bowl and stir until totally mixed in. Fold in the flour, and then spoon the mixture into the pudding basin. 5. Place the parchment and tin foil layer over the top, and secure with string. Make a small handle out of string to make it easier to lift the pudding out later. Put the pudding into a large, deep pan with an upturned plate in the bottom, and pour boiling water into the pan until it reaches halfway up the side of the basin. Cover with a lid, bring to the boil, then reduce the heat to a gentle simmer. Add more boiling water as necessary, so the pan doesn’t boil dry during the cooking process. Steam for 3-3½ hours, or until the sponge is firm and a skewer inserted comes out clean. Take the bowl out of the water, and leave to sit for 20 minutes before you turn it out. 6. To make the custard, whisk together the egg yolks and caster sugar in a large measuring jug until well combined, then set aside. Pour the milk, cream and vanilla paste into a pan and heat until the mixture starts to steam. 7. Pour a small amount of the warm mixture into the eggs and whisk quickly to combine. Slowly add the rest of the milk and cream mixture into the eggs, whisking all the time. 8. Return the custard to the pan and heat on medium, stirring all the time, until the mixture thickens and coats the back of the spoon. Stir in the brandy and pour over your turned-out pudding. If you want to make the custard in advance, you can reheat it from cool in the microwave, or in a pan over a low heat.